As we head into the special session, projections of our state's budget shortfall get worse and worse. And the specter of massive cuts-or even a few tax increases-looms larger every day. Letters and e-mails are flying about who's going to get cut. At one recent town hall in my district, a constituent came up to me afterwards in tears because I had told the crowd that the State Coverage Initiative (SCI), one of the state's few affordable health insurance programs, might get cut. "I have cancer," she said, "and I'm on the program." Her remarks got me to thinking how high the stakes were in this economic downturn and how easy it is to forget some basic principles. So here they are, my guidelines for making these hard budget decisions. 1. Don't make cuts that cause people to die. Yes, some cuts in funding will have that dire of an effect. One Aids patient, for example, left a message on my answering machine asking me to think very carefully about cutting Medicaid funding for the Aids waiver, which now goes mostly to medications and counseling. His life, literally, hangs in the balance. The Aids & HIV positive patients are not alone. There are thousands of medically fragile children, seniors in nursing homes with life threatening conditions, cancer patients and others served by the Medicaid program, which will need $300 million just to stay afloat next year. 2. Salary reductions, if there are to be any, should be done on a sliding scale-not across the board. What sense does it make to cut the meager salary of an educational aide, who makes $8.00 per hour the same percentage as an administrator who makes $100 an hour? Yet, this may be the effect of across-the-board cuts, particularly if it is the administrators who decide how to implement reductions. 3. Don't cut off your nose to spite your face. As much as some folks resent federal funding, it is a fact of life that our Medicaid program gets four federal dollars for every state general fund dollar that we put into health care services for almost 500,000 low-income New Mexicans. Cuts to the program are magnified four-fold and that doesn't even count the major economic role that the health care sector plays here, especially in small communities. At a recent committee meeting we were told by one economist that, as a result of the "multiplier" effect," $300 million taken out of this program means a loss of about 15,000 jobs-in hospitals, clinics, medical offices and associated areas. Ironically, the health care sector has been one of the fastest growing ones here in the past decade, with a gain of about 30,000 jobs until the recession hit. 4. Those who profit from the recession must do their share-and pay up. As is often the case in recessions, the pain is not equally shared. As small businesses struggle to stay afloat, mortgages are foreclosed and bankrupsies escalate, the parking lots at Wal-Mart and other discount stores have filled up. Often these out-of-state corporations have eluded taxation because of a loophole in our tax code called "combined reporting." These out of state companies are not paying their fair share. Senator Dede Feldman (D-Albuquerque) is the Chairman of the Senate Public Affairs Committee. Read what my guest blogger Representative Mimi Stewart has to say about the upcoming New Mexico legislative special session and the implications of education budget cuts for New Mexico's children. Mimi is an educator and represents New Mexico's 21st District. She has served in the legislature for 13 years is entering her 16th year as a legislator in the New Mexico Legislature! The special session is approaching and in almost every newspaper article, the question comes up, "Should we cut education?" Those in favor, most of the Gang of 12, who are making decisions for the rest of us, answer, "Yes, because the education portion of the budget is so large, it's only fair to cut education!" Of course, we've already cut education. Last session, for the first time in my 15 years of serving in the Legislature, we cut the education budget significantly. Not only did we cut funding per student by almost $60, affecting all aspects of all 89 school district budgets, but we did not fund health insurance increases and we required most employees to pay more for their own retirement out of their salary. We also used Federal stimulus money to plug a $167 million hole in our ability to fully fund the budget for education…..a temporary fix that will create more problems later. So now we're in trouble. Education is now about 43% of the state budget, way down from 52% 10 years ago. There are 330,000 students in the public schools, being taught by 21,000 teachers and almost as many support people, without which the schools could not operate. Think of any societal ills, and then ask how these problems might impact students and thus our public schools. Children of alcoholic parents have horrible home lives and terrible parenting. Children of adults in the penal system often don't know where they will be sleeping that night or are being raised by someone else. For those and so many other children, we need counselors, social workers, extended school year programs, and before & after school programs. New session. Big new financial challenges. Same Governor. Same Senate leadership. That about sums up the first few days of the 2009 legislative session for me. It's a long session and a steep uphill climb. But I have confidence that, with your survey results to guide me, we can make it. I've already introduced nine bills, with more to come. The Governor and the Legislature are now hashing out a solvency plan for the current fiscal year, where we have come up $450 million short. This must be accomplished before we can go on to tackle ethics reform, health care, the education funding formula, next year's budget or any of the other issues that you've been seeing in the media. Results are still coming in from the survey I sent out to 6,000 of my constituents in late December. So far, I've gotten about 530 returns-a great response. Many of you took the time to write detailed messages as well as filling out the form. Thank you so much. I am humbled by your participation and ideas. When it came to balancing the budget in this time of shortfall, your first choice was using money from unspent capital projects. The second choice was raising income taxes on the highest brackets, and the third choice was tapping into the tobacco tax permanent fund. You are not averse to raising taxes, with 53% of you saying you were not the "No New Taxes" type. In fact, 92% want to increase cigarette taxes, 90% favor increased local option alcohol taxes, and a slim majority (52%) favor a 1% increase in gross receipts taxes for a boost to the public school funding formula. If it comes to temporarily cutting programs (and it will) you identified cultural affairs as the first choice, roads and buildings second, and water projects third. Last choice for cuts was public education, and programs for poor people. My first priority-- when it comes to the budget-- will be protecting funding and access to quality heath care and public education. It will be a tall order. I am glad to hear that you would give up a little of the capital outlay money that I've been able to bring back. That will probably be necessary. With the help of the Attorney General, I am sponsoring a bill to limit campaign contributions, and one to establish an independent Ethics Commission. I am also trying to strengthen the one pay-to-play bill that we have on the books, which I passed in 2006, and open up legislative conference committees to the light of day. Maybe this is the year. When it comes to health care, 96% of you wanted to mandate that hospitals report hospital-acquired infections; 92% want insurance companies to allow patients to choose their own doctor by contracting with any qualified provider; 92% want to maintain Medicaid funding levels, 89% want pharmaceutical companies to disclose the value of gifts given to doctors and other providers, and 74% want a Medicare-style universal insurance coverage pan for all. Last week I introduced a bill to require insurance companies to contract with qualified providers so that patients can maintain their doctors even if they have to change plans. About 12 other states have this plan. I also introduced a bill to require pharmaceutical companies report gifts over $25 (except for free samples) made to doctors. UNM Health Sciences Center has already banned these gifts. I plan to sponsor another bill on hospital-acquired infections as well. Meanwhile, the administration this year is taking a more incremental approach to expanding health care coverage, including some important insurance reforms and consolidations that I support. *94% want stronger enforcement and increased penalties for Off-Highway Vehicle operators who damage public and private property. Sen. Phil Griego and I will introduce a bill this week to address this problem. *77% want modest improvement of trails along ditches. This week I will be introducing a bill to dedicate a small portion of property tax revenues collected by the Conservancy in Bernalillo County to a trails program on selected ditches and drains. Bernalillo County taxpayers account for 68% of the assessments paid to the District, although most do not irrigate. Here's an opening day picture of me with newly elected Senator Steve Fischmann who defeated Republican Whip Leonard Lee Rawson. Thanks again for sharing your views. Please contact me while I'm in Santa Fe at 1-505-986-4300, e-mail me at dede.feldman@nmlegis.gov. or drop by my office in Room 300. Information on various bills, schedules and committees is available at www.legis.state.nm.us. I'll be sending out periodic e-newsletters and I'll continue to post new as often as I can on my blog at http://senatorfeldman.typepad.com. Last week, the Rio Grande Community Farm, located on the Los Poblanos Open Space at Montano and Rio Grande, made history. It delivered the first batch of local produce to APS for use in cafeterias in the Valley High School Cluster. I'm proud of them. Our sugared-out kids will benefit-- and so will local farms struggling to find markets and thus survive. A WIN-WIN indeed. This is the way to keep local farms in business and prevent childhood obesity and diabetes. I'm glad to have helped by providing seed money for the healthy purchase. This is the kind of pilot program which needs to spread district and even statewide. For more information on the local food movement, and how you can get involved, go to www.farmtotablenm.org. Pictured here: August 21, 2008. Pictured from left to right: Joan Quinn, RGCF Heritage Board Member; State Senator Dede Feldman, Heritage Board Member and sponsor of legislation appropriating funds to buy locally grown produce; Steve Carleton, APS Food Services Supervisor; Stephanie Dobbie, current RGCF Board Member, Minor Morgan, RGCF Treasurer; Marcia Walton, RGCF Staff. As if growing vegetables for school kids weren't enough, the RGCF recently opened its annual corn maze, a family treat that builds leadership, trust and orientation skills for young and old alike. And it's just good old fashioned fun. The maze, located at Los Poblanos Fields Open Space at 1701 Montano Rd. NW is open Friday evenings from 6:00-9:00 pm, on Saturdays from 10:00 am to 9:00 pm, and on Sundays and Holidays from Noon-6:00 pm. Adults are $8 and children 4-12 are $4. Kids under 4 are free. Don't loose 'em! There's a special moonlight Maze Sep. 12-13 and Oct. 10-11. Call 505-345-4580 to book groups or classes or go to www.riograndefarm.org for the whole low-down. Rep. Mimi Stewart Talks ABout Teaching Reading……or Not! We welcome Guest Blogger, Representative Mimi Stewart, who talks about an issue which is critical to the future of New Mexico's work force. Please feel free to share your views and leave a comment for Representative Stewart. About 6 years ago, "Where We Stand" editorials from Sandra Feldman, the then president of the American Federation of Teachers, appeared in my legislative magazines. It was high stakes testing time, and her column highlighted the achievement gap as already a factor when kids begin school. She suggested extending the school year for high poverty students and called it "Kindergarten Plus." I was an Early Childhood Liaison at the time and I was excited by her proposal because Kindergarten teachers had lamented repeatedly to me, "If I just had some more time with these young kids...!" As a legislator, I offered House Bill 61 in 2003, the first in the nation, naming it "Kindergarten Plus" after Sandra Feldman. This project has been so successful that last year I offered HB 198, "Kindergarten to Third Grade Plus," another pilot extending the school year for 25 days in Kindergarten through 3rd grade for high poverty students. Legislators were so impressed with the high academic achievement for students in Kindergarten Plus, the new bill passed easily. But what about the naysayers who cry, "Just adding days doesn't make a difference!" To them I say, yes, adding days is only half the battle. Our biggest battle in elementary schools is how we are teaching reading. The old reading wars are over, and we have won the battle. Trouble is, most teachers and administrators don't know the terms of the settlement, i.e. what does the research say about the way children learn to read? If you are a brain surgeon and a colleague discovers a procedure that can save the lives of another 5% of your patients, within two months, everyone is using the new procedure. Why is it so difficult in education to extend our knowledge of teaching reading? We're not getting much help from our colleges of education; many of those professors are in denial, have never themselves taught struggling children to read, and are not held accountable for the lack of success in public schools. We now have strategies, procedures, and new knowledge, based on scientific research, that enables us to teach 95% of our students to read, not just the current 40% we are reaching. If we start early, if we use explicit and systematic teaching of the five big ideas: phonemic awareness, the alphabetic code, fluency, vocabulary, and comprehension, and if we will make the commitment to train teachers in these strategies, we can diminish almost every education problem we are facing. But where is the leadership in our districts and at the state level that is promoting the science of teaching reading? In fact, at both the state and local levels, we are making decisions that deny the research on teaching reading, decisions that will continue to yield reading scores among the lowest in the country. Change is hard; some say we have to honor educators' belief systems. But teaching reading is not a religion. It's hard work, rocket science, in fact, and just as important. It's time for real leadership in teaching reading in New Mexico. 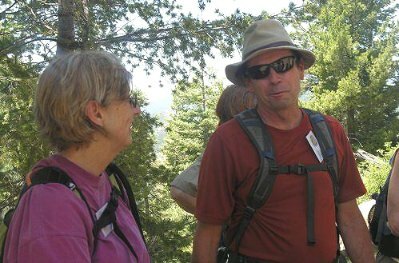 Our guided hike, sponsored by the Friends of the Valle Grande, walked around Cerro del Abrigo, a mountain in the middle of the preserve from which you could see several different valleys – Valle San Antonio, and Valle Toledo-- and mountains, including Redondo Peak and Pajarito Mountain. There were great volunteers along who were wild flower and bird specialists from Los Alamos, and tour guide Craig Martin, who wrote a great book about the Baca Location called, Valle Grande: A History of the Baca Location No. 1. It’s a paperback from All Seasons Publishing ( ISBN 0-9639040-4-3) that’s available from Bookworks in the North Valley and other local bookstores. After the hike, we had a barbecue with a power point from Craig on the history of the land. I’m not a huge fan of power points but for history buffs and naturalists, though, this was great. To Find out more hikes and other activities at the Valles Caldera Preserve, go to www.vallescaldera.gov.